Editor’s note: This post covering the whole grains blogging food group is part of our series on creating a well-balanced diet of content marketing. The series provides tips and examples for the following blogging food groups: Whole Grains, Vegetables, Meats, Condiments, and Desserts. Your audience is looking for relevant content and you can deliver it to them by incorporating a healthy serving of the whole grain blogging food group into your strategy. 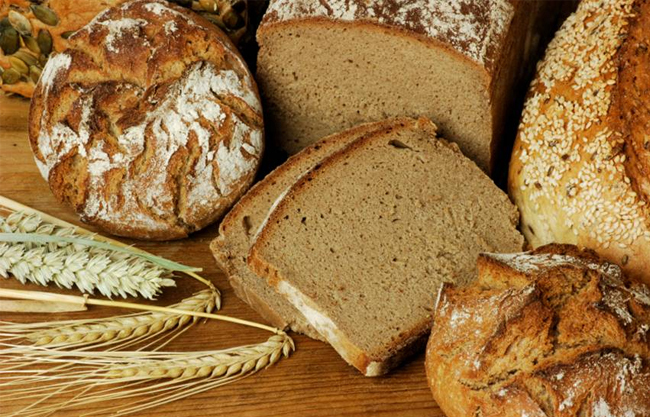 Whole grain content plays an essential role in content marketing plans because it provides readers with a satisfying source of information and education. Although whole grain content is similar to 'meat content' in that it is filling for your audience, it often requires far less planning and resources to create. Read on to discover three types of whole grain content, along with examples of each you can use for inspiration. Example: “Dropbox for Business” is a professional-centric blog from the folks at Dropbox. 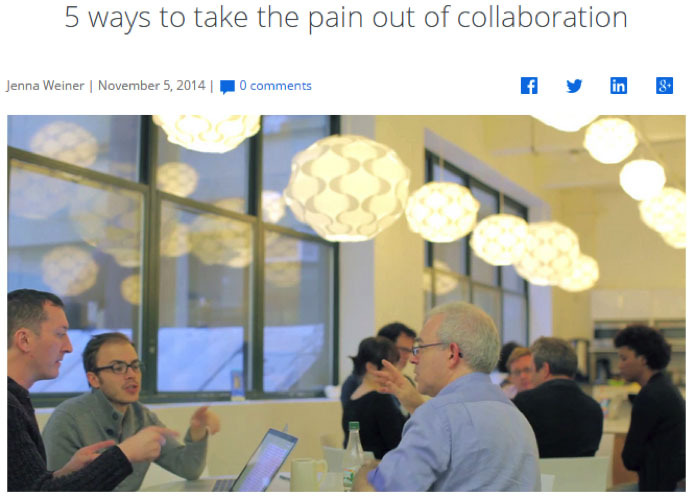 One of their recent posts, “5 ways to take the pain out of collaboration,” is a how-to article that provides advice on the common challenge of collaboration – a topic that also ties into Dropbox’s brand narrative. The article lists five action-oriented items that businesses can easily put into practice for greater efficiency. Key takeaways: How-to posts are a staple of B2B blogs for good reason. They provide educational, actionable information in a format that is easy to digest. They often include a list of steps readers can take to accomplish a task or solve a problem. Example: Evernote, which was recently recognized for having one of the Top 10 Company Pages of 2014, regularly shares helpful content on the LinkedIn platform. 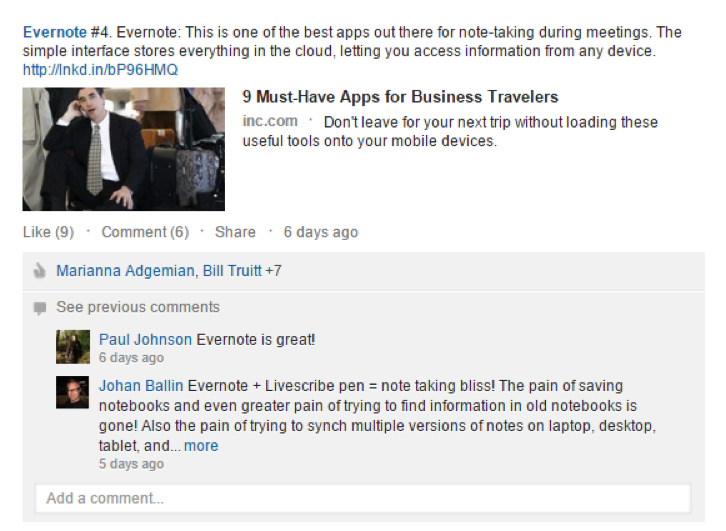 In the Company Page update below, Evernote shares an Inc. article which its professional audience may find useful. Of course it’s also nice when the article touts your offering. Key takeaways: Featuring shared content from well-known thought leaders or publications can allow your audience to more easily identify with your brand’s message, especially when it presents your product or service in a positive light. 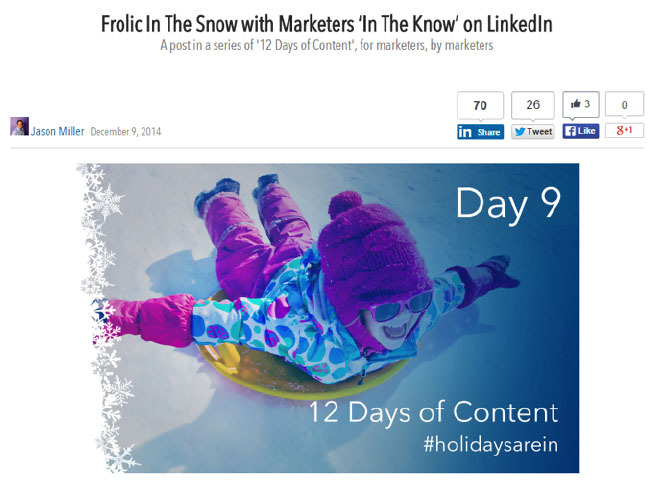 Example: Our team recently repurposed an eBook, Frolic in the Snow with Those in the Know as part of our 12 Days of Content series. 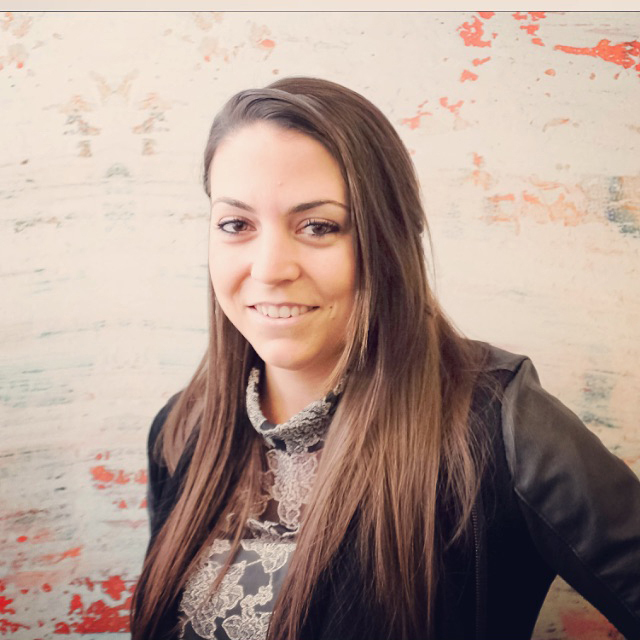 We simply provided three new content marketing insights from the eBook contributors while providing our readers with the opportunity to read through the original SlideShare presentation. Key takeaways: Repurposing hearty, “big rock” content that garnered engagement can greatly improve your content marketing efficiency. Start with opportunities that are right under your nose. Do you have an eBook you can repurpose into a SlideShare presentation? How about a video you can feature in a blog post? With its practicality and ease of execution, it is easy to see why whole grain content represents roughly a quarter of all content created by brands. It is our hope that you and your marketing team will draw from these examples to provide useful, actionable content your readers can readily put into practice. Learn how to expand the reach of your content marketing strategy using LinkedIn. Download The Sophisticated Marketer's Guide to LinkedIn.